UGH, doesn’t she sound like a huge bitc….debbie-downer?! We all know her because she lives in all of us. She also goes by the name, “Inner Critic”. She’s that voice in our head that is constantly trying to bring us down and prevent us from following our biz dreams. And she can definitely get the better of us if we’re not careful. Her goal is to keep you stuck in Fear Town so you never make anything of yourself. 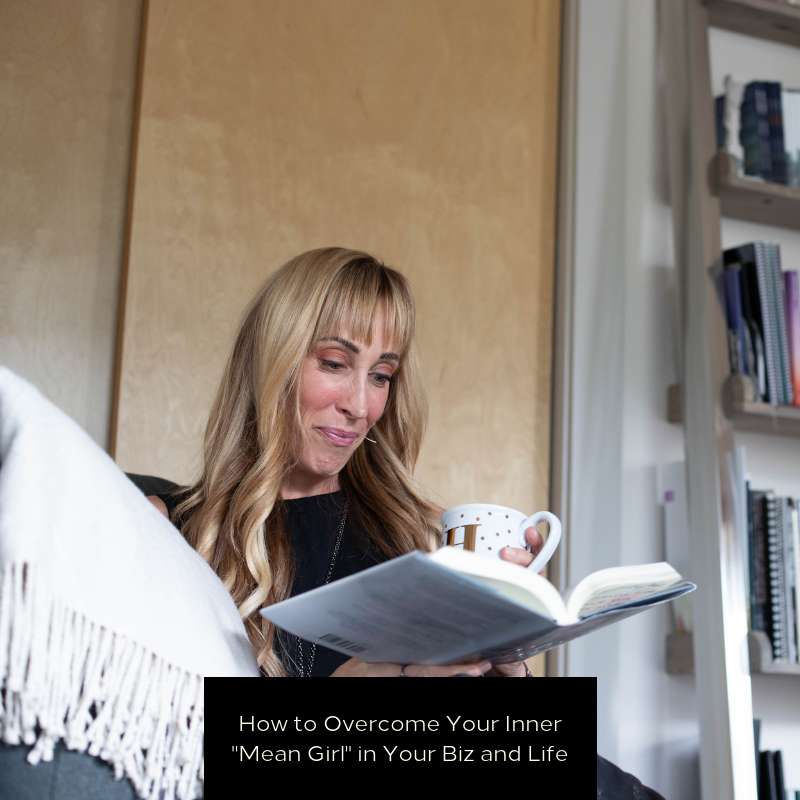 My good friend LITERALLY wrote the book on the subject, Mastering Your Mean Girl, became a bestselling author...and conquered her own mean girl. Melissa Ambrosini is also the host of 'The Melissa Ambrosini Show' podcast, a motivational speaker, an entrepreneur and self-love teacher. She’s INCREDIBLE. And she joined me on my own podcast this week...check it out. 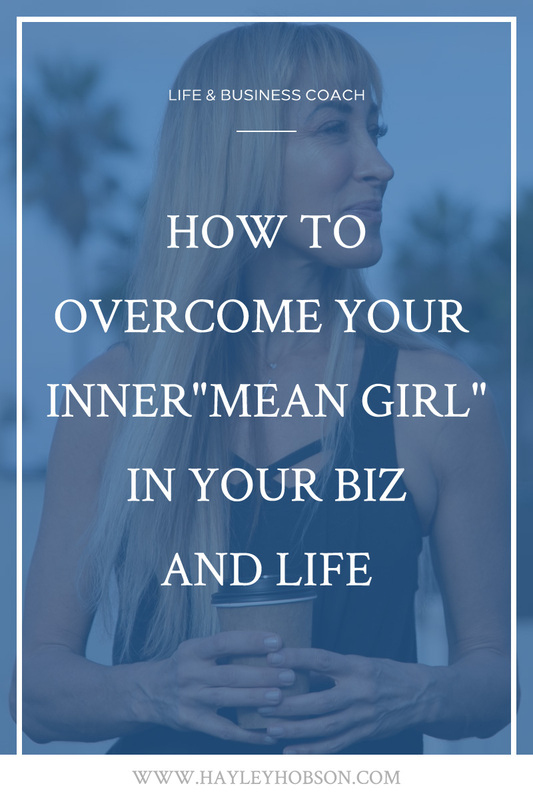 She’s all about helping women rid themselves of their Mean Girl, and I’m here to help you deal with yours in your biz. Because girl — you definitely deserve to be happy, make an amazing income, and experience success. Once you silence that fear-based voice in your head, you’re going to realize how life is meant to be lived...and how your passion can become your work. Your business is going to start flourishing. You’re going to start to feel ALIVE. Because guess what, no matter what Mean Girl says, you DO deserve to have it all. There are so many great ways to overcome that voice in our heads and it all starts with love. I’m not trying to be corny here, it’s true. Mindset is everything. So every morning, I want you to try something. Sit down at your computer and tell yourself how awesome you are, how loved you are, and how you WILL succeed at whatever you decide to tackle that day. Instead of letting those Negative Nancy thoughts start swirling around in your head, stop them in their tracks and battle them with positivity and love. What are you thankful for in your business; in your life? Starting the day with a simple gratitude exercise is another great way to put things in perspective. You’re going to get that client. You’re going to make your deadline. You got this. We all need to work on #selflove. It’s time to kick fear to the curb and choose love instead. Another way to show Mean Girl the door is to live in the moment. And a great way to do that is by meditating. Start living in the moment and feel that peace girl! That’ll shut-up that “you’re not good enough” voice in no time at all. Finally, another Mean Girl tactic is self-sabotage. So you stop. You quit. You feel paralyzed. You tell yourself all kinds of story so you don’t have to keep on keeping on…. Ugh, honestly, I’m ready to come over there right now and teach your Mean Girl a lesson because I’m sick of her treating you like this. That voice is toxic and you would never talk like that to your best friend. So stop talking like that to yourself. That voice can make you give up before you even try. You have worked so hard to accomplish everything in your biz and you CAN do it. You deserve it. The problem with self sabotage is — most of the time we don’t even realize we’re doing it because we’ve been doing it for far too long. And guess, what? Self-sabotage is a CHOICE. It’s actions you are taking, on purpose, to avoid what you think will be fear or pain. Having a proper mindset and practicing meditation will help with this but you also have to start being your own witness. One thing you can try is sit down and write down all of your negative thoughts, worries and fears. Let it all out! Then take this piece of paper and have a little ceremony! Burn it, throw it away, get rid of it. Then re-write your story. Start writing down what you want to achieve and what that success looks like. Write down all the possibility. And then keep that somewhere safe and close and if you need to, reference it every day. It will help you start catching those negative thoughts quicker so you can start being more productive in your biz. And soon enough, you’ll start seeing that positivity manifesting itself in your work and your biz. I believe in you girlfriend...now start believing in yourself. What does your Mean Girl sound like and how are you going to start getting rid of her? Let me know in the comments, I’d love to help you out! I just had this happen this morning! Way down in “low vibe town”. Beating myself up for not fully understanding something in my business training. And then I saw this email! Thank you God! “Ask and it shall be given” Thank you so much Hayley for this message at just the right time!? ?